We performed an extensive redesign of the Hillsboro School District website. To populate the new site over 225 pages were migrated as were hundreds of archived news posts dating back to 2004. The district logo was redesigned and the site includes custom photography, a calendaring system, news archiving system, flash photo gallery, and much more. 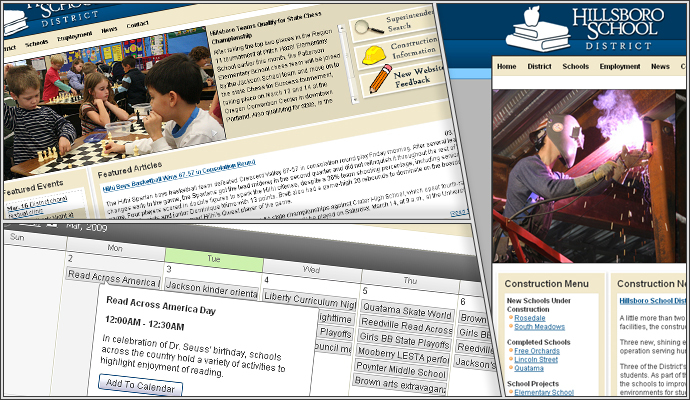 In order to help organize this site the navigation was redesigned to include a secondary navigation custom tailored to Parents, Staff, and Community members. All of the content on the website was reorganized to best reflect the visitor’s needs and to easily organize future updates that are currently made by the HSD staff.